Established in 1996, Cheshire based AccuTime Ltd now have more than 5000 customers. Our dedicated team are here to provide a Worldwide Mail Order Service for Clocking in Machines, Time Recorders and Attendance Systems. These are user friendly, high quality products at a sensible cost. 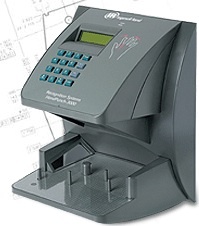 Our range extends from Simple Clocking In Machines through to Fingerprint Recognition PC Linked Time and Attendance Systems and Time Recorders, No matter whatever the size of your business you can buy with confidence from AccuTime. Please do not hesitate to contact AccuTime for advice on the right system for your business. AccuTime Ltd are highly regarded as a supplier of all makes of, Clocking in Clocks, Time Recorder, Clocking Systems, Time Recorders, Time and Date Stamps, Time Stamps, Supplied Including, Seiko Clocking Machines, Max, Blick, Bodet, Seiko, Zeus, Addtime, Timeware, Acroprint, Nippo, Amano, deister, QR375 clocking in machine, QR350 clocking in machine, TP10, TP20 diester, Vertex, Watchmans Patrol Clock, NTR Clocking on Machine.